• No. 21 Texas A&M 52, no. 9 South Carolina 28: Did anyone see this coming? I certainly didn’t. Las Vegas sure as hell didn’t, having installed the Gamecocks and their 18-game home winning streak as 10-point favorites in Columbia. If any of the self-appointed experts in the preseason prediction business saw it, they kept it to themselves, ranking South Carolina 11 spots higher than the Aggies on average. That made sense: This A&M offense would be taking the field for the first time, on the road, without its transcendent, program-defining quarterback, and without two other starters who were taken among the top 10 picks in the NFL draft. Even with those guys in the fold last year, the unit struggled to offset a truly putrid defense. No one could have seen this coming. No one, apparently, other than the people who pay Kevin Sumlin’s salary. They saw it from miles away. In retrospect, amid the glow of Thursday night’s win, A&M’s decision to make Sumlin one of the richest coaches in college football may not look like such conspicuous foresight. Remember, though, that when the school inked its head coach to a six-year, $30 million contract last December, it was placing a hugely expensive bet on a guy with a relatively short résumé. Five million dollars a year is Nick Saban money.1 Mack Brown money. After just two seasons in College Station, Sumlin was suddenly set to make more than ring-bearing veterans Urban Meyer, Bob Stoops, Les Miles, and, yes, Steve Spurrier in 2014, despite having yet to claim a conference championship or a BCS bowl bid as a head coach at Texas A&M or Houston. Based on preseason expectations, the 2013 Aggies actually underachieved, dropping four games after opening the season in the top 10 of virtually every poll. Five million dollars buys a lot more pressure than patience. Prior to 2012, Texas A&M had finished unranked in 11 of 12 seasons since the turn of the century, and was considered a lamb to the slaughter in the transition to the SEC. How much of Sumlin’s initial success stemmed from the freewheeling, insanely productive, and entirely unpredicted panache of Johnny Manziel? How much vanished along with Manziel when he turned pro? With Mike Evans? Jake Matthews? What, exactly, would keep A&M from descending back into the mediocrity that preceded their arrival? One game shouldn’t be enough to answer all of those questions, and in the long run, maybe we’ll realize it wasn’t. Maybe as the season wears on, we’ll come to view Thursday night as more of a mirage than a template. But few games offer as stiff of a test for a young team as a road trip to a top-10 opponent, and it’s hard to recall another team in that scenario passing with such gusto. The offense came out of the chute fully formed, pedal to the floor. Seven of A&M’s first eight possessions resulted in points, on drives covering 67, 75, 85, 75, 80, 66, and 42 yards. For good measure, the Aggies scored again on possession no. 10, a 10-play, 83-yard march in the fourth quarter; only decorum prevented them from tacking on another score on drive no. 11, a 17-play, 78-yard slog that drained the final 10:05 from the clock. By halftime — halftime! — they’d racked up more points (31) and as many first downs (23) as South Carolina allowed to all but one opposing offense in 2013. Sophomore quarterback Kenny Hill, making his first career start in one of the most hostile environments imaginable, put the ball in the air 60 times for 511 yards, easily smashing Manziel’s single-game school passing record. In all, A&M’s 680 yards of total offense were the most ever allowed by a Spurrier defense at any of his stops as a head coach, its 52 points the most ever surrendered by a Spurrier team at home. The last two teams to drop 50 points on South Carolina, Florida in 2008 and Auburn in 2010, both went on to win the national championship behind a pair of force-of-nature quarterbacks. Yet if it’s too soon to start comparing Hill to Tim Tebow and Cam Newton, much less the amazing Manziel, it’s also impossible to deny Hill’s ceiling after such a smashing intro. The other comparison that comes immediately to mind is Jameis Winston, who served notice of his impending dominance last year with a flawless debut on national television at Pittsburgh. One game in, Hill has taken all the usual anxieties that come with a new starter and tucked them snugly in bed. What’s truly terrifying for the rest of the SEC, however, isn’t how off-the-charts the Aggies’ performance was, but how routine. In 17 conference games under Sumlin, A&M has exceeded 40 points in 10 of them and 600 total yards in seven; in consecutive bowl games, it’s managed offensive bonanzas against Oklahoma (633 yards, 41 points) and Duke (541 yards, 52 points). Line up Thursday night’s outburst alongside last year’s games against, say, Alabama (628 yards, 42 points), Auburn (602 yards, 41 points), and Ole Miss (587 yards, 41 points), and it begins to look like another night at the office — albeit one with better overall support from the defense, particularly the front seven.2 If the defense is still an issue for A&M, it’ll be well into October before it makes the slightest difference, thanks to a schedule that’s conveniently backloaded from here on. At the very least, the October 18 trip to Alabama now looks like a blockbuster to rival last year’s ballyhooed shootout in College Station. In the meantime, the bridge from the Manziel era to whatever comes next appears to be fully intact, with nothing lost in translation and no “rebuilding” required. Sumlin has put the Aggies on elite footing in the SEC recruiting wars and continues to put opposing coaches to shame on the chalkboard. Johnny Football was a start, a spark plug, and perhaps a necessary one to get the machine cranked and humming. But let there be no doubt: A&M is built to last. • No. 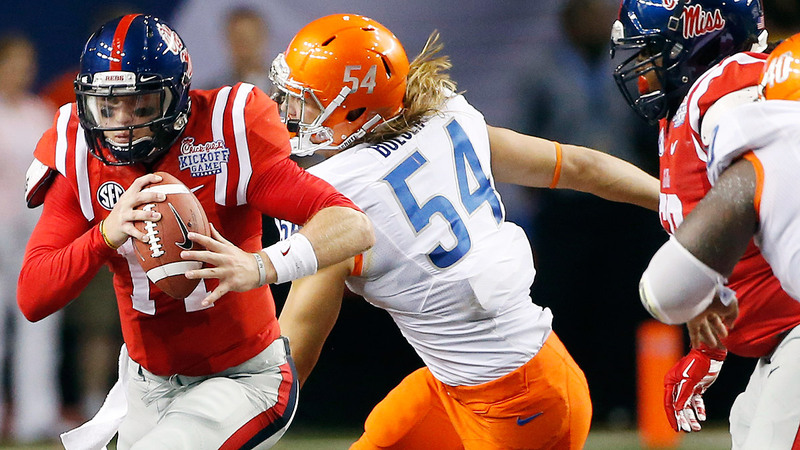 18 Ole Miss 35, Boise State 13: Ole Miss comes out of this one feeling a little better than it probably should offensively, having papered over three quarters of frustration with four touchdowns on four offensive possessions in the fourth. Once the Rebels ignited, Boise State’s secondary went up like tissue paper, yielding scoring passes of 14, 31, and 76 yards on consecutive passes by Bo Wallace, followed by a 19-yard TD run by Mark Dodson for good measure. At the start of the fourth, though, the score was 7-6 Ole Miss, and that’s more reflective of the kind of game this really was. Wallace was all over the place in the first half, throwing three interceptions, and the Rebels got nothing from the ground game, which managed 52 yards on a miserable 1.6 per carry before Dodson’s dagger. The offensive line was flagged for eight false starts. Between Wallace and Boise State’s Grant Hedrick, who was intercepted four times, this could have been renamed the Pick-fil-A Classic.3 In the same vein, the most positive theme of the evening was the fundamentally sound violence of the Ole Miss defense, which did its part to salvage the fading pedigree of Ess Eee See Defense by repeatedly laying the lumber to Boise receivers in a fashion that, at the current rate, will probably be illegal by the time the freshmen in this game graduate. Up front, sophomore defensive tackle Robert Nkemdiche still looks like he was carved from an oak tree, and now he has a clue what he’s doing. If the Rebels have any chance of surviving in an insanely competitive SEC West, they’re going to have to look a lot more like Alabama than Texas A&M. • Temple 37, Vanderbilt 7: Congratulations and all to Temple, a team that earned exactly two wins in 2013 and hadn’t beaten an SEC opponent on the road since 1938, but Vanderbilt looked like hot death. In their first game under head coach Derek Mason, the Commodores’ offensive possessions for the night yielded seven punts, six turnovers, and a missed field goal. (Special teams contributed a seventh turnover by fumbling on a kickoff return.) Their only points came on a botched punt by Temple in its own end zone in the first half, but Vanderbilt returned the favor a few minutes later by allowing the Owls to return a fumble for a touchdown. The last two years at Vandy under Mason’s predecessor, James Franklin, were arguably the best in school history, or at least since the Korean War: The Commodores won nine games in each, sneaking into the bottom of the Top 25 for the first time since 1948. From the look of it, that brief flirtation with the win column may as well be ancient history now, too. With Franklin at Penn State, the team that showed up on Thursday night looked like a serious threat to lose to UMass. • Rutgers 41, Washington State 38: Yes, Washington State remains a bad team, but it proved again that it’s also an imminently watchable team because it’s so determined to play to type. On one hand, the Cougars offense delivered a quintessentially extreme Mike Leach stat line, passing for 532 yards and rushing for six. On the other, the defense conceded a 78-yard touchdown pass on the first play of the season and went on to yield 17 points in a down-to-the-wire fourth quarter. In that context, it’s hard to tell if Rutgers tailback Paul James (29 carries, 173 yards, 3 TDs) is really a star in the making, or merely the product of a defense that tends to make a lot of opposing backs look great, but I suppose there’s no reason it can’t be both. Yes, it is, Demarco. Yes, it is. Just don’t dwell too long on a pair of long Carolina touchdown passes in the first half, one the result of a badly busted coverage by A&M’s young secondary. The guy Broncos fans are judging Hedrick against, former BSU Jedi Kellen Moore, once went an entire season without getting picked off four times.